Anti-Fatigue Mats come in different sizes, surface materials, thicknesses and applications. Choose from Entrance Mats, Industrial Mats, Runners, Comfort Mats, Foam Mats, Diamond-Plated Mats and many more. 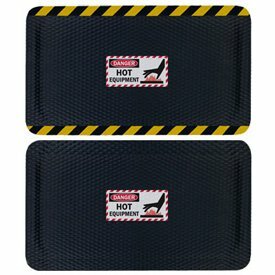 Our variety of Anti-Fatigue Mats ensure your employees are comfortable, safe and not concerned with his/her footing. Seton’s top-of-the-line mats provide excellent anti-fatigue properties providing safety and comfort for your workers. Our mats boasts durability that’s guaranteed to last 3 times longer than traditional 100% PVC foam mats. Anti-Fatigue Carpets and Mats are soft and cushiony to lessen the stress on feet and legs. Anti-Fatigue Carpets and Mats are generally laid in places where workers frequent often, or in areas where workers are on their feet for long periods of time. The cushioned surface of these mats helps to reduce fatigue from standing. Seton offers a selection of mats and carpets, including Autoclavable Mat, Modular Diamond-Plate, Electrically Conductive Anti-Fatigue, Safety-Step Anti-Fatigue Mats- Black Solid Top, Industrial Deck Plate Mats & Runners and more.